Digital Forsyth | Train locomotive being moved to Tanglewood Park in Clemmons, N. C., 1954. 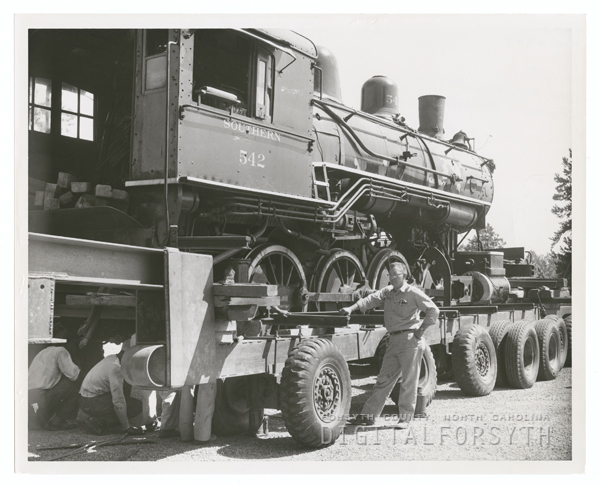 Home › Photos › Train locomotive being moved to Tanglewood Park in Clemmons, N. C., 1954. Train locomotive, Southern No. 542, being moved to Tanglewood Park in Clemmons, N. C.
The engineer who drove 542 on its last run to the Clemmons station was my Uncle, Doit Holthouser. When steam engines were replaced by diesel, he transitioned over to diesel. Although he could operate both types, his first love was steam engines.